POWERFUL, LIGHT, AND VERSATILE. IT IS IDEAL FOR SPOT CLEANING AND EXTRACTION OF CARPETS, UPHOLSTERED FURNITURE AND VEHICLE INTERIORS. FROM FLOOR TO CEILING THE KARCHER AB 84 WILL QUICKLY DRY HARD FLOORS, UPHOLSTERY, TEXTILES, DRAPERY AND EVEN DRYWALL. 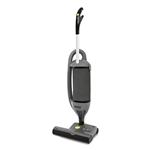 Covering a large space and need a vacuum that will handle the job? Then you have come to the right place! Whether you would like to tackle the job with the BV 11/1 back pack vacuum or need a powerful Puzzi Spot Cleaner/Extractor, we carry Karcher floor care equipment and parts for every situation. 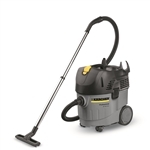 On this page you can find Karcher vacuum cleaners, sweepers, floor machines, scrubbers, extractors and accessories. Has your electric broom neared the end of its long battery life or do you just need a refill on paper filter bags? We carry all your replacement needs as well. Remember that all of our commercial floor & carpet cleaning machines feature a 30-day NO HASSLE return policy and orders over $100 receive FREE shipping. If you need help deciding on the right vacuum for your specific job, please don’t hesitate to reach us at 877.277.1988. We would be happy to answer any and all of your questions.